The U.S. Copyright Group (USCG) has been all over the news in recent months. The lawyer group sued thousands of BitTorrent users who allegedly file-shared motion pictures belonging to their clients, including the Oscar-winning Hurt Locker. However, it turns out that USCG are not copyright purists either, as they have blatantly copied the website of a competitor without permission. During May this year the makers of The Hurt Locker filed a complaint against the first 5,000 ‘John Does’. Helped by the U.S. Copyright Group (USCG), the film makers are requesting the personal details of individuals behind the IP-addresses that allegedly shared the film on BitTorrent. With these personal details in hand, USCG is planning to send out a batch of settlement requests asking the alleged file-sharers to pay amounts up to $2,500, or risk a full trial and a heftier fine instead. In recent months USCG has already sent out similar ‘speculative invoices’ to downloaders of other films, including the indie movie Far Cry. It’s needless to say that the administrative process to handle thousands of settlements will involve quite a bit of work. 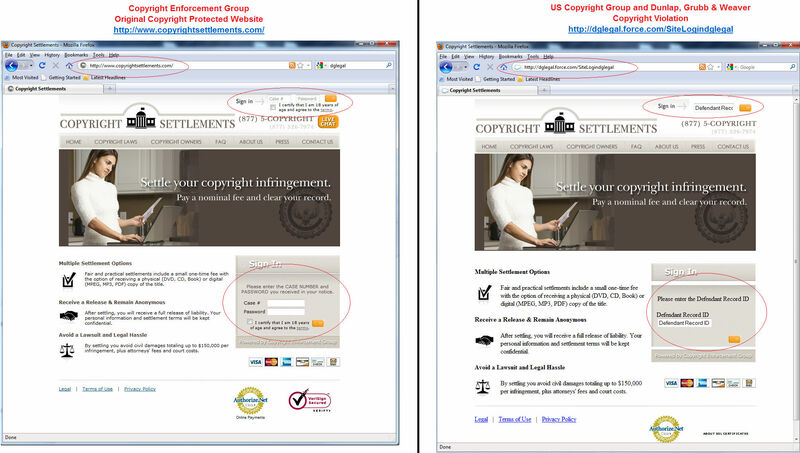 To make this easier for themselves and the alleged downloaders, USCG recently put up a settlement website where visitors to their main website Copyrightsettlements.info are redirected to. By itself the mere existence of this settlement portal wouldn’t really be newsworthy, but this changed when we realized that they had copied it from a competitor. Six weeks ago a TorrentFreak reader alerted us that USCG was setting up a new website to deal with the settlements. Instead of coding the site themselves, they had simply copied the code (including the copyright statement) and images from a company in the same line of work. The images below show how both sites looked at the time. Because the USCG site was hosted on a force.com subdomain, we weren’t able to verify the legitimacy of this site to find out if there was indeed a direct connection to USCG. To be honest, we simply couldn’t believe that USCG would be stupid enough to blatantly rip-off a website like this, so we assumed that someone had tried to pull off a prank. A month after the email, however, the same site popped up again when we tried to access the website of USCG. Although the original layout was stripped down significantly over the past weeks, the website still uses code and images from the Copyright Enforcement Group. Initially, USCG even listed their competitor’s phone number on their site, but they were wise enough to remove this and other texts that refer to the Copyright Enforcement Group. That said, there is no doubt that USCG’s website is ‘stolen’. Both the source code and the copied image names clearly reveal that the code was blatantly copied from their competitors. Armed with this knowledge we decided to contact the victims of this apparent violation to ask if they had perhaps authorized this use. The answer we got was clear. “Thank you for bringing this to our attention. We are not associated with the US Copyright Group and they are not authorized to use Copyright Enforcement Group materials,” a representative of the Copyright Enforcement Group told TorrentFreak in a response. The same representative told TorrentFreak that the US Copyright Group and Dunlap, Grubb & Weaver will be receiving a cease and desist from Copyright Enforcement Group. Of course, we’ve seen this type of behavior before. The UK’s ACS:Law, also writing to thousands of file-sharers demanding cash payments for alleged infringements, aren’t whiter than white either. They took sections of several news articles and tried, unsuccessfully, to pass them off as their own content on their company website. So there we have it once again. An outfit that targets copyright infringers is actively infringing copyright themselves. They are so incompetent and probably blinded by the dollar signs in their eyes, that they can’t even put a website together without breaking the law themselves – copyright law. Update: USCG has started to remove some images after our post. This file, among others, has been replaced by a ‘placeholder’. A confession?